Where to find fruinergy ? 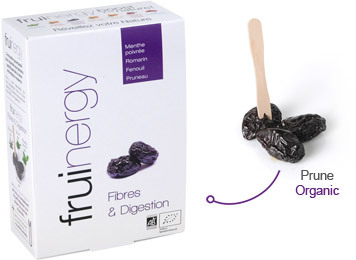 fruinergy Fibers & Digestion combines prune with a choice of plants traditionally used to facilitate digestion. Peppermint (Mentha piperata) is known as a stomach purifi er and contributes to the intestinal health. Rosemary (Rosmarinus officinalis) stimulates digestion and helps alleviate upset stomach. Fennel (Foeniculum vulgare) has a true antispasmodic action. fruinergy Fibers & Digestion is rich in fibers and a source of chlorides which contribute to a normal digestion thanks to the production of hydrochloric acids in the stomach. fruinergy Fibers & Digestion is made with environmentally friendly techniques. Its carefully selected ingredients add up to a high quality product with authentic taste. GDA: Guideline Daily Amounts indicate the amount of energy and nutrients used by an adult with an average daily intake of 2,000 Cal. *DRI : Dietary Reference Intake, which are guideline daily amounts for vitamins and minerals corresponding to the requirements of an average adult.